What does full immigration control mean in practice? There was a short period of just 11 years between 1962 and 1973 when free movement of people did not apply in the UK. Other than during that time, businesses and public services have had easy access to workers from other countries. Following Brexit, the UK will be embarking on a similar period. If the full force of UK immigration law is brought to bear on all foreign nationals, this will require major adjustments in economy and society. One wonders how long the interregnum might last this time. This blog post is based on notes for a talk I was due to give last week but had to pull out of owing to illness. It was originally inspired by the Twitter musings of Simon Cox. We often talk casually about “British citizens” but British citizenship is a relatively recent innovation. There has only been such a thing as a British citizen for just the last 34 years, since the British Nationality Act 1981 become law on 1 January 1983. Before that, there were Citizens of the United Kingdom and Colonies, or CUKCs. Born in Swindon in 1959? You would have been a Citizen of the United Kingdom and Colonies. Born in Swahililand in 1960? You would have been Citizen of the United Kingdom and Colonies. Both had the same rights and entitlements and were allowed to live and work anywhere within the territories of the United Kingdom and Colonies. There was total freedom of movement. Not only that, but that right of free movement was extended to all citizens of the Commonwealth as well, a much larger area even than the colonies, particularly as more and more countries gained independence. This citizenship status of “Citizen of the United Kingdom and Colonies” was created by British Nationality Act 1948, which came into force on 1 January 1949. It replaced the status of “British subject” which pre-dated it. After the war, Commonwealth countries decided they had had enough of quite literally being British subjects and decided to establish their own citizenships. CUKC status was the British effort and it applied equally to all within the UK and colonies. But there remained an umbrella status of Commonwealth citizens who retained free movement rights. In the post war boom the UK needed immigrants. There was a Royal Commission on Population which reported in 1949 and which stated immigrants “of good stock” would be “welcomed without reserve”. And so they came, from all over. Irish immigration remained high under separate rules and many Europeans came to the UK in that period as well, as well as migrants from the Commonwealth. Famously working as bus drivers, manual labourers and nurses, these foreign nationals helped the UK rebuild after the trauma of the war. Enoch Powell, health minister from 1960 to 1963 in the Macmillan government, famously invited Pakistani and Bangladeshi doctors and nurses to come to the UK because of a staffing shortage in the NHS. 18,000 are reported to have come. By 1971, 31% of all doctors in the NHS were born overseas. But pressure to restrict immigration grew. In 1962 a Conservative government passed the Commonwealth Immigrants Act 1962, which for the first time curtailed free movement for citizens of Commonwealth countries and the Colonies. A notable group remained exempt from control because they had CUKC passports issued by the UK government: the East African Asians, as they became known. They were residents of Kenya, Uganda and Tanzania whose families were originally of Indian origin and who had made use of their rights of free movement as British subjects within the Empire to relocate, encouraged by the British and colonial governments. The accepted norm was that when a country became independent, the citizens of the new country would lose the citizenship of the old country and gain the citizenship of the new country. The residents of these new, independent countries would no longer be CUKCs and would be subject to controls under the existing 1962 Act. The problem was that some new countries excluded a whole swathe of residents from their new citizenships: the East African Asians. If CUKC status was removed from them, they would literally be stateless. If they were allowed to retain it, they might well move to the UK, as was their right, particularly given that the fact they were being excluded from citizenship in the new countries was a sign of worse to come. The UK started withdrawal from the Commonwealth free movement area in 1962 and finished the job in 1968. This time it was a Labour government which introduced new controls. Under the new Commonwealth Immigrants Act 1968, a CUKC could only live and work in the UK if they, or at least one of their parents or grandparents, had been born, adopted, registered or naturalised in the UK. This excluded almost all of the East African Asians, leaving them with the empty shell of a useless umbrella citizenship status, stranded in countries that would not given them local citizenship. In short, the 1968 Act explicitly created a two tier system of citizenship rights based on parentage. This was further codified in the Immigration Act 1971, which introduced the disturbing language of “patriality” to the right to live and work in the UK. In 1973 the UK entered a huge new area of free movement of labour and people: what was then called the European Economic Community. There was no “big bang” for immigration, though. 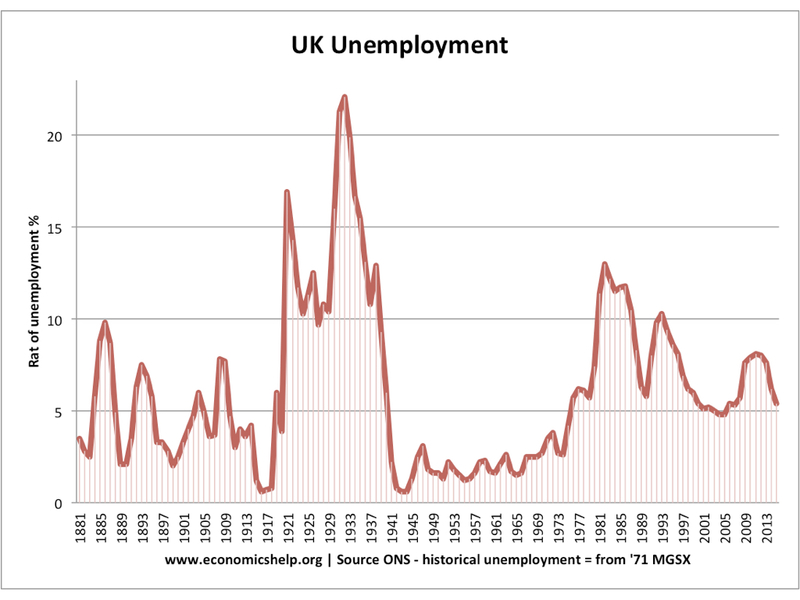 The 1970s and then the early 1980s were a period of significant unemployment in the UK and economic contraction or very slow growth. There was no need for migrants, basically, and no-one would have wanted to come. This was long, long before Cool Britannia. 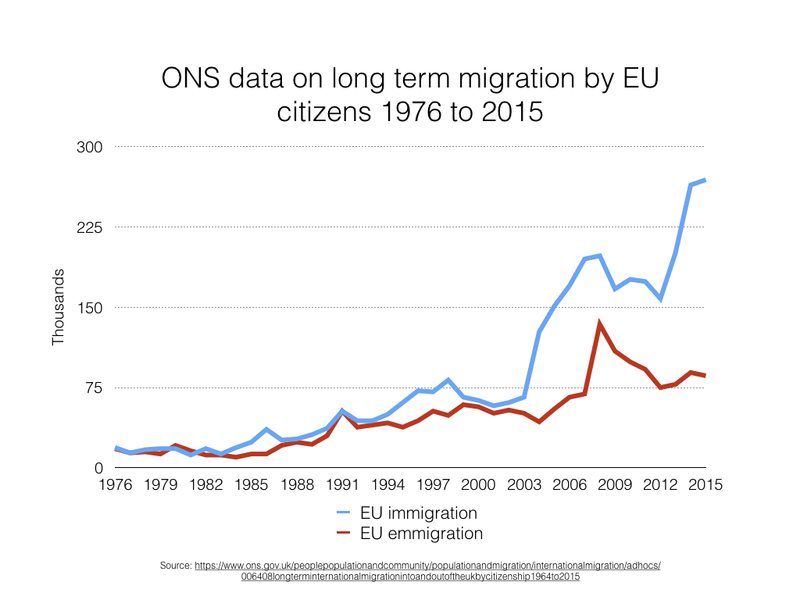 Inwards migration from the EU was a slow burn to begin with. We can see a gradual rise in immigration, but emigration broadly keeps pace. It is only from 2004 onwards we see significant net migration. In legal terms, EU nationals were initially treated the same as other migrants under the same set of laws, but with specific immigration categories which only applied to them. A patchwork quilt of EU regulations and directives enabled specific but wide groups of EU citizens to move around the EU, including workers, the self employed, students and family members from within and without the EU. When economic growth really got started, unsurprisingly we see significant rises in migration. Before we move on, bear in mind that unemployment rates were historically very low indeed in the post war period until the mid 1970s, which was a clear indicator of a need for labour. The migrants who arrived had no problem finding work and there was no issue about them displacing native workers. Back in the interregnum period of the 1960s and 1970s, before membership of the EEC started to take effect, the UK was considered the sick man of Europe. Post war unemployment was low and the economy grew, but at a slower rate than our closest neighbours. 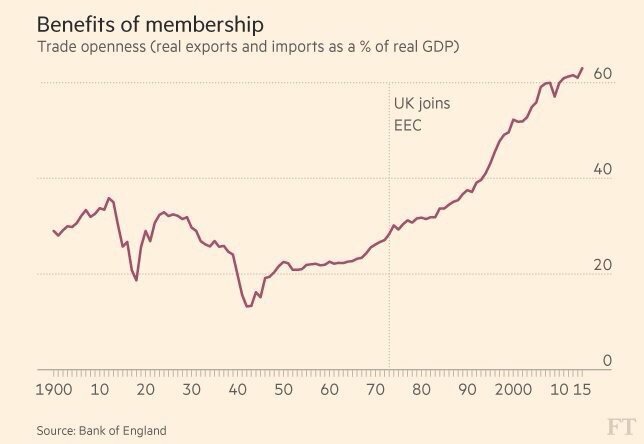 That started to change once we joined the EU and after the single market reforms of the 1980s. Will that growth continue once we leave the EU? A quick note on the first three tragedies. Firstly, it was the working classes who voted for us to leave because they were economically disregarded and it is they who will suffer the most in the short term from the dearth of jobs and investment. They have merely swapped one distant and unreachable elite for another one. Secondly, the younger generation has lost the right to live and work in 27 other countries. We will never know the full extent of the lost opportunities, friendships, marriages and experiences we will be denied. Freedom of movement was taken away by our parents, unless and grandparents in a parting blow to a generation that was already drowning in the debts of our predecessors. Thirdly, and perhaps most significantly, we now live in a post-factual democracy. When he facts met the myths they were as useless as bullets bouncing off the bodies of clients in a HG Wells novel. When Michal Gove said “the British people are sick of experts” he was right. But can anyone tell me the last time a prevailing culture of anti-intellectualism has lead to anything other than bigotry? Will it really be that bad? Will jobs and investment really dry up? Will opportunities, friendships and marriages really be lost? Won’t EU citizens still want to come here because it is all so marvellous in this country? It will be that bad. Trust me, I’m an immigration lawyer. Free movement, whether Commonwealth or EU, is by its nature frictionless. A person can simply be employed as long as they hold the right passport, no further questions asked. The UK immigration rules are not frictionless. They have traction. They chaff. They rub. And they are supposed to, because they are intended to make migration to the UK difficult and to keep people out. Let us think about a fairly common scenario – falling in love and wanting to live in the same country as your loved one. At the moment, all an EU national need do is show their passport as they enter the country – that’s it. That is for this year. The fees are going up by around 20% per year at the moment and the Conservatives will triple the cost of the NHS surcharge after the election, so it will be much higher in future. And that is before legal costs; these days applications are so complex and require so much paperwork that lawyers are routinely needed. There are other restrictions. The sponsor must earn at least £18,600 for a period of at least 6 months (a rule which separates families moving to the UK from abroad) and the spouse has to pass an English language test. That figure too will rise after the election. In short, it will be a LOT harder for British citizens to have serious relationships with EU nationals in future. Another common scenario is to employ a foreign worker. As with a spouse, at the moment all an EU national need do is show their passport as they enter the country – that’s it. The Conservatives will double the Immigration Skills Charge by 2020, so those costs are going to increase yet further. 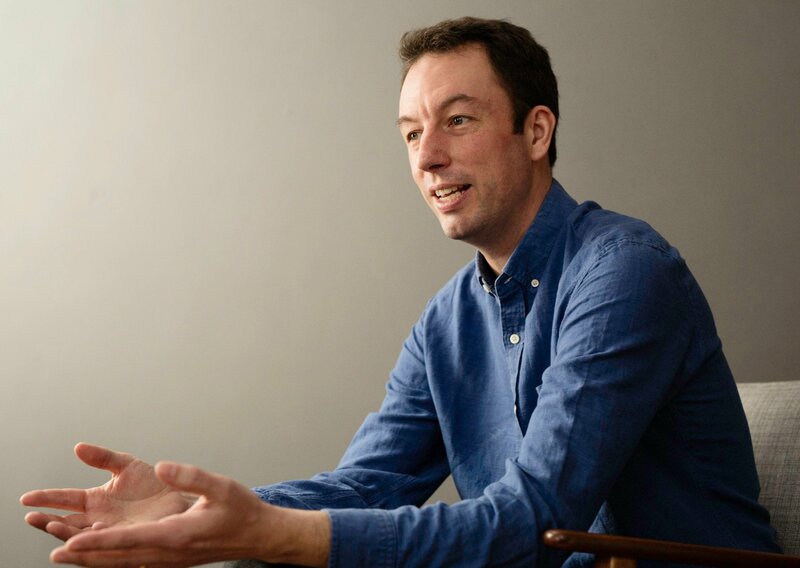 the cost of onerous sponsor administrative and compliance duties imposed by the Home Office, which can be extremely time consuming but neglect of which leads to loss of the sponsorship licence and therefore current and future foreign workers. So what will employers do when they need workers? For example, what will a farmer do who needs labour for crop picking? Will the farmer find British workers to do the work? They don’t seem to want to and there is no pool of unemployed workers as unemployment is low (for now). Or will the farmer leave the crops to rot, grow different crops, or just stop growing crops and try to sell the farm? How about the house building boom the politicians are always promising is just around the corner? Where will the workers come for that? If you are a construction company looking to make a profit building houses, where will you find the builders? There are insufficient trained UK builders and unemployment is low. 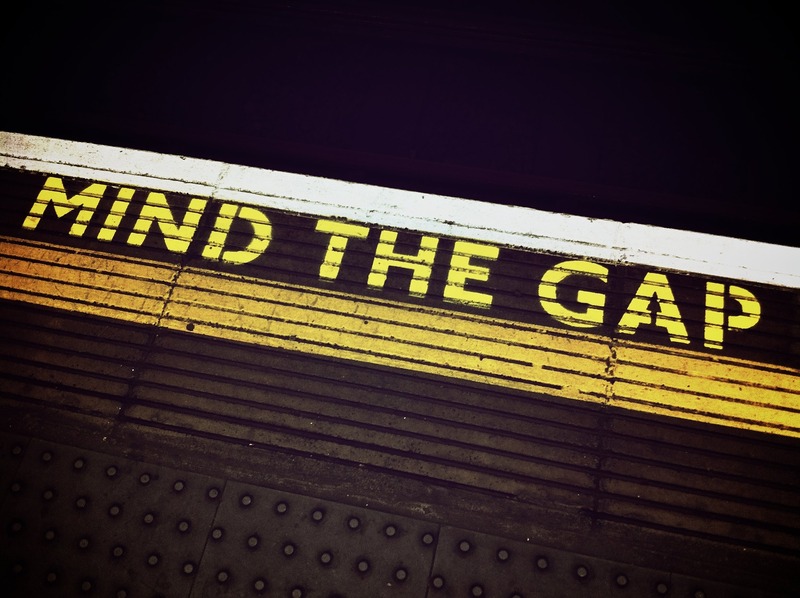 Will you pay more and see your profits diminish or disappear but carry on regardless? Will you simply not build houses as it is not worth it? Will you somehow recruit young school leavers and train them up? Even if so, how will you build any houses in the mean time? Or the nurses and doctors needed for the NHS? When you look at what different ministers are saying, the minister for Environment, Food and Rural Affairs wants a sector based scheme for bringing in seasonal low skilled workers. The minister for housing wants a sector based scheme for builders. The Chancellor wants a sector based scheme for bankers. The minister for health wants to be able to retain and recruit doctors and nurses from the EU. Even Liam Fox, the disgraced and so far pointless minister for international trade, has recognised that immigration is part and parcel of any serious international trade deal. Every minister seems to be realising that migrant workers are essential to their sector of economy and society. The fact is that ending free movement and reducing net migration to tens of thousands per year would be disastrous for the UK economy and society. A detailed report published today by Global Future suggests net migration of 200,000 is necessary. But politicians will not admit it. With no proper or meaningful debate, either immigration will be drastically reduced, causing huge damage and making everyone poorer, or immigration will remain high and the politicians will be accused of broken promises. Neither outcome is a desirable one. We’re always being told that we need a “debate” about immigration, usually a coded way of saying “voters don’t want immigration, therefore we need to limit it”. We do need a debate about immigration: about the need for immigration.